It's one-thirty in the afternoon. Husband will be home in a couple of hours. My hair is unwashed, and the house is pebbled with marbles and Tinkertoys. This week we have survived a stomach virus, back-to-back preschool and doctor's appointments, two visits from an incompetent dryer repairman and basketball tournament. As much as I want a break, I need to get cleaning first. 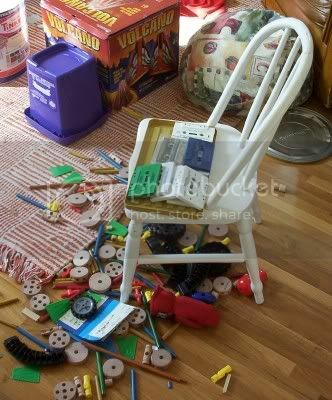 I began with a tirade about the tiny toys all over the floor, patiently explaining that I could slip and hurt the baby if my son didn't pick them all up immediately. The little one acted nonchalant. "Oh, really? I think the Legos would improve your traction." Really--sometime this kid is too bright for his own good. I'm sorry you've had such a rough week. Those stomach bugs are nasty stuff. I hope you have a nice calm weekend. Thanks! You, too. Painting trim should feel like a vacation for you after a week of nonstop bathroom emergencies. My mother took away my legos after she stepped on them one to many times. She said she would, and she did! 25 years later I'm still sad about it.